I was going to post a different blog but have just been listening to a brilliant podcast for Classics Confidential. 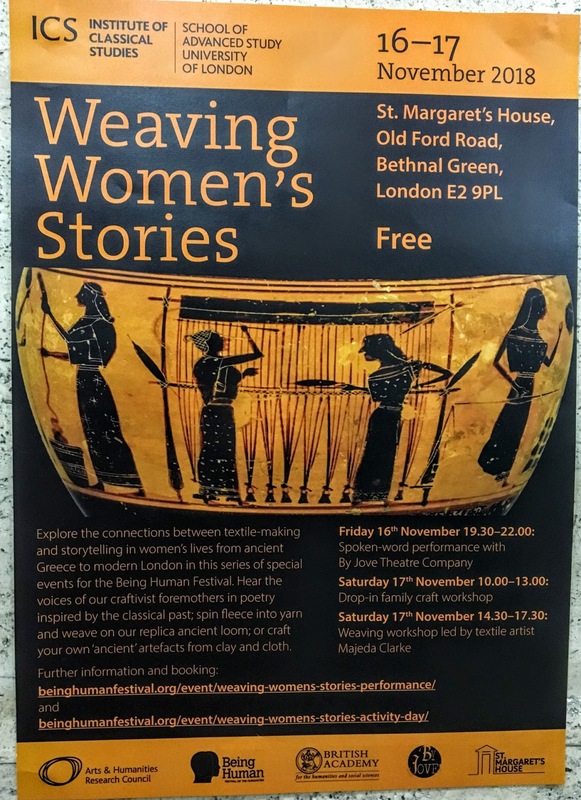 It was specially produced in honour of the Being Human Festival and in particular two events centred around ancient weaving: a poetry performance next Friday 16 November and a hands-on weaving workshop on Saturday 17 November 2018. Jessica Hughes the host of Classics Confidential starts out by interviewing Dr Emma Bridges (Institute of Classical Studies) who talks about the links we still make between weaving and storytelling in phrases such as ‘spinning a yarn’ and ‘weaving a tale’. The word texta, woven, gives us the word text. The ancient sources also used metaphors of weaving. 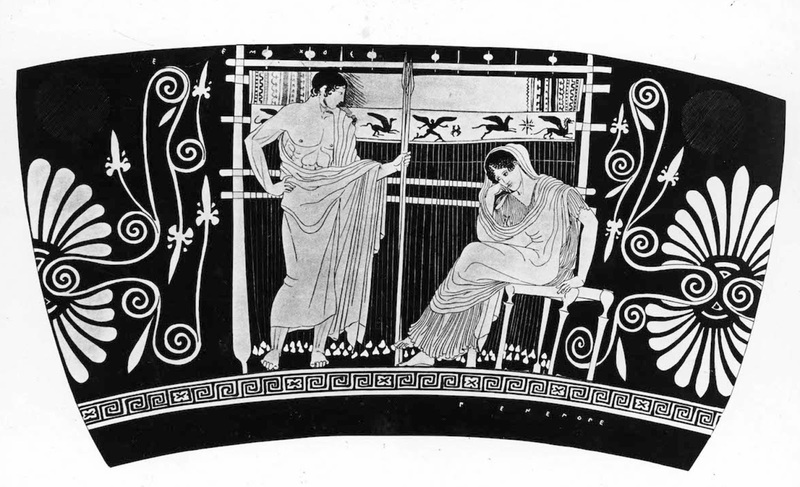 For example, Odysseus ‘weaves a scheme’ in Homer’s Odyssey. Dr Ursula Rothe from the Open University talks about the different fabrics they used: wool, linen, cotton and silk, (which was a very expensive – and decadent – prestige product.) Camel hair and goat hair were used for bags and sacks and we know of felt workshops in Pompeii. Professor Mary Harlow from the University of Leicester is a Roman historian who specialises in textile production. Her own warp-weighted loom will be one of the focal points of the Being Human Weaving Women’s Stories performance and activity day. Mary started out dutifully researching all the literary and visual sources but it wasn’t until she went to Denmark to work at the Centre for Textile Research that she had a revelation about ancient textiles. ‘I had to rethink the whole process from the beginning,’ she says. ‘And in so doing I’ve also become a practitioner. I’m an avid hand-spinner and addicted to natural plant dyes… And most recently I’ve begun to learn to weave on a warp-weighted loom.’ One of her revelations was that the finished garment must have already been in someone’s head, because every stage is geared to the specific product. 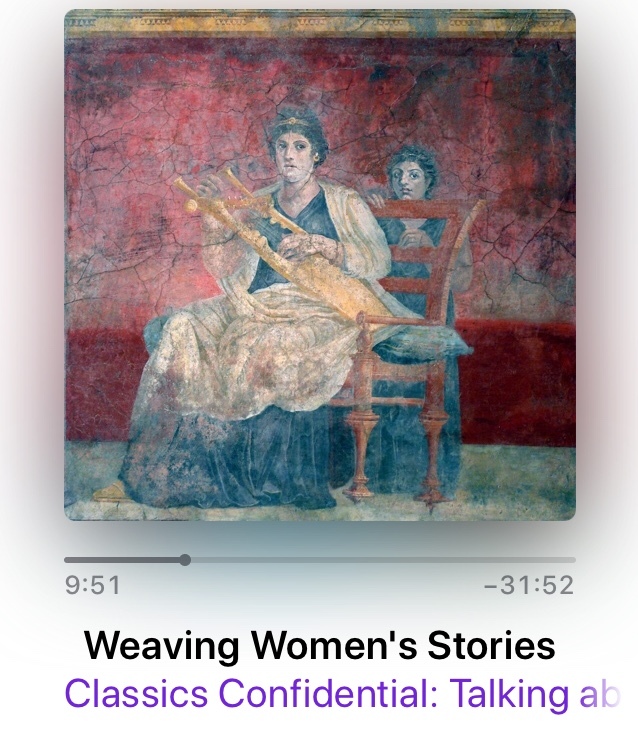 Mary mentions a friend of hers, the scholar Magdalena Öhrman, who is doing research on the sound a loom makes and the way the cadences of Ovid’s poetry possibly imitate this sound. There are many other great revelations in the podcast. • Emma Bridges (again) shows how male poets like Homer and Ovid portray women who weave and also how the story of Penelope has been retold in more modern times. Emma points out that the loom provides a medium for women to express themselves when they are repeatedly silenced by men, e.g. 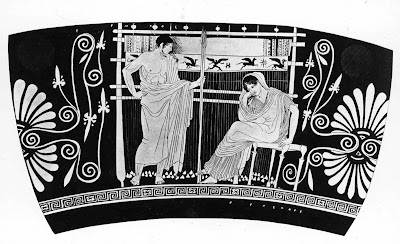 the way Penelope is twice silenced by her son Telemachus in the Odyssey. 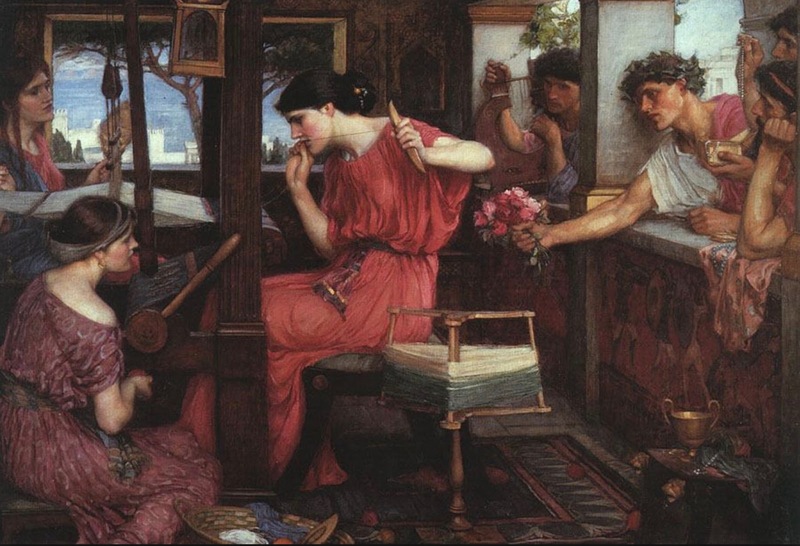 Circe and Calypso both sing at the loom but Penelope is silent. 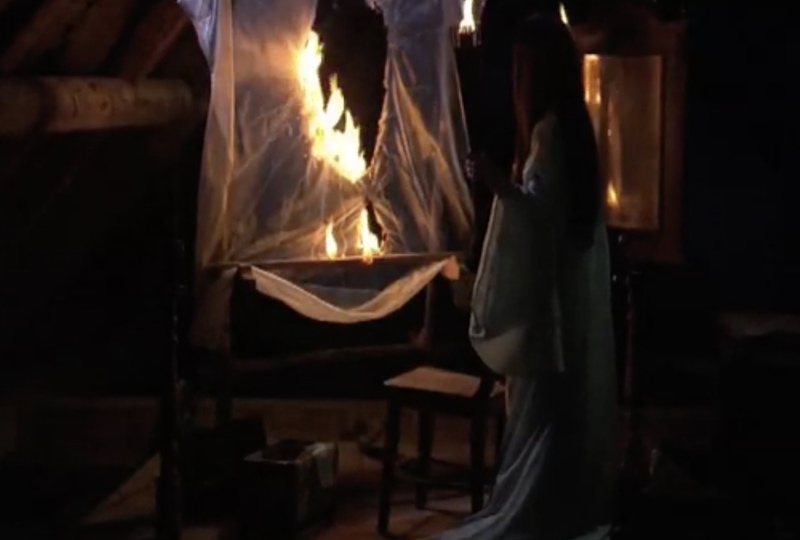 So is Philomela, who is raped and then silenced by her abuser. Ovid has her ‘tell’ her story in her weaving. Emma talks about Waterhouse’s 1912 painting of Penelope and her Suitors and also an extraordinary art installation by Brazilian artist Tatiana Blass called Penelope. 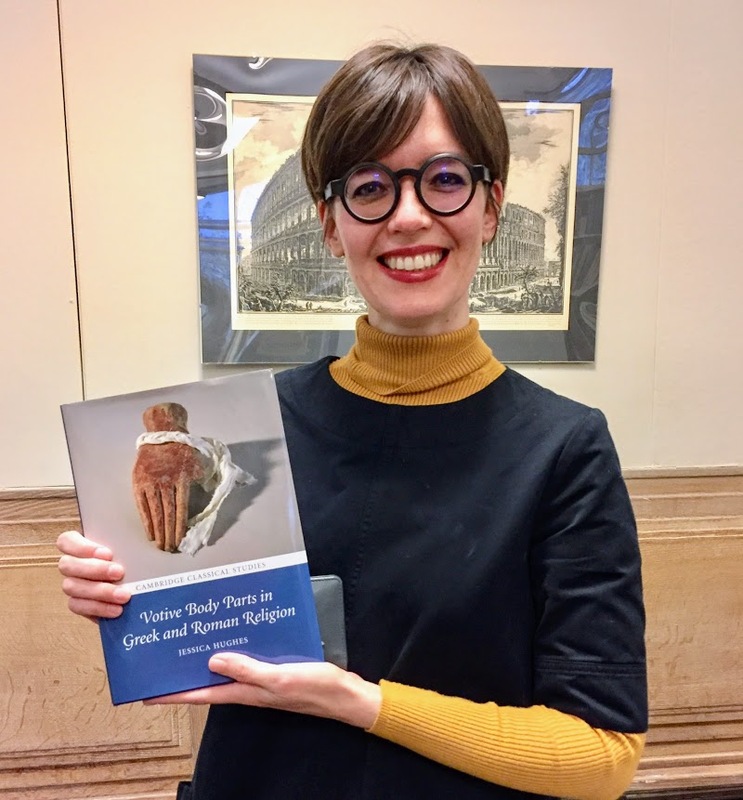 • Ellie Mackin Roberts (Royal Holloway, University of London) talks about the arrephorroi (the group of very young girls who lived on the acropolis for a year and wove a peplos for Athena’s statue) and what their sensory experience would have been. For example these girls of perhaps seven or eight might have been asked to card the wool. This would have made their hands greasy with lanolin this would have made washing at the end of the day a different experience than usual. • Ben Ferris (Sydney Film School) talks about his 2009 feature film, Penelope, a fantastical treatment of Homer's tale of Penelope, depicting her psychological struggle as she waits twenty years for her husband to return from the Trojan War. 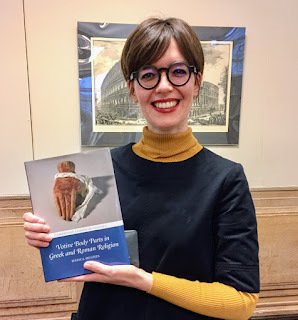 • Anna Fisk (University of Glasgow) is a knitting practitioner and academic researcher in contemporary craft practices and implicit religion. One of her observations is that some women find knitting almost like entering into a prayerful state. To hear the whole podcast either subscribe to Classics Confidential or listen on SoundCloud HERE. A performance of women reading original poetry inspired by weaving will take place on Friday 16 November 2018 and on the following Saturday there will be weaving workshops. The afternoon session is sold-out but the morning drop in is free. I don’t usually emerge from my writer’s lair on dark winter nights but I’m making an exception for this and I am sure it will be worth it. I hope to see you there! This is fascinating. Thank you for posting it. Anyone interested in weaving would also enjoy a book called "Women's Work: the first 20,000 years" by Elizabeth Wayland Barber - about the origins of weaving and textiles. Great post. I really enjoyed reading about this. I've always been fascinated by the world of weaving. I want to speak to your manager! WHAT'S IN A NAME? by Penny Dolan.